Carrillo Beach, one of the finest in the country, is located on the southern coast of the Nicoya Peninsula, next to Samara Beach. It extends along a small bay for 3 kms, and is fringed with palm trees, wooded hills and clifs that create a site of great scenic beauty. The pounding of the sea against the cliffs, the crystal-clear water, the fine, white sands, the constant sunshine and a sense of peace are the major features of this site on the Pacific Coast. Walks can be taken along the rocky platforms at low tide where some marine life can be observed, specially in the little tidal pools. The major attractions of the developed sectors of the coast are the large number of hotels geared to international tourism and the worldwide famous spot for sportfishing.The climate is hot and dry from December to the end of April, and hot and humid the rest of the year. 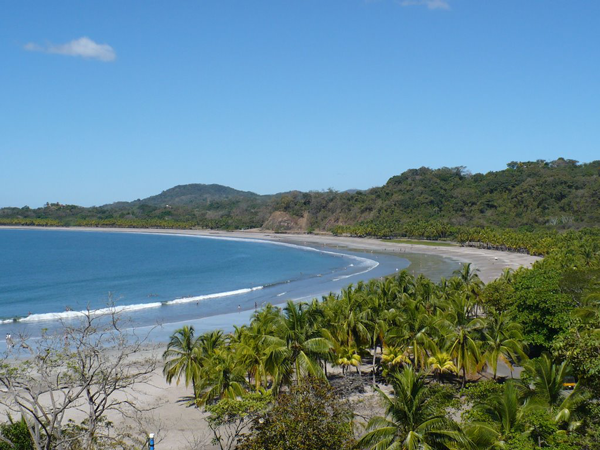 The beach is located 43 kms from Nicoya alongs flagstone road that ends right at the shore.